Viral factories are intracellular compartments (inclusions) which increase the efficiency of viral replication-assembly and shield it from host defenses. Viral factories can be either cytoplasmic or nuclear and often arise from extensive rearrangement of host cell cytoskeletal and/or cell membrane compartments . Viroplasm are electronic dense cytoplasmic inclusions where viral replication and assembly take place. They are produced by Nucleo-Cytoplasmic Large DNA viruses (NCLDV) like poxviridae, asfarviridae and iridoviridae, dsRNA viruses like reoviridae ans ssRNA(-) viruses like filoviridae . Spherules are 50-400nm diameter membrane invagination in which takes place viral replication. 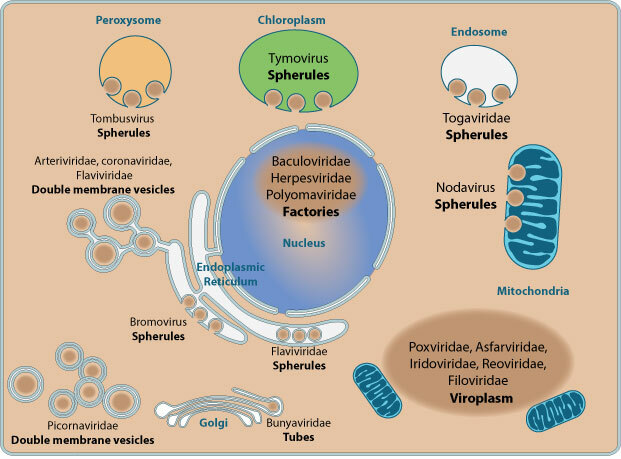 They can appear on several enveloped cellular components depending on the virus: Tymoviruses on chloroplasts, Tombusvirus on peroxysomes, Nodaviridae on mitochondria, Togaviridae on endosomes and lysosomes and Flaviviridae on endoplasmic reticulum. All these viruses have a dsRNA replicative intermediate, and they may replicate in isolated compartments to be hidden from the dsRNA activated innate cellular immunity . Double membrane vesicles (DMV) are membraneous structures derived from the endoplasmic reticulum or Golgi having a diameter of about 200-300nm. They are produced by Picornaviridae and Nidovirales: Arteriviridae and Coronaviridae. All these viruses produce dsRNA intermediate during replication, and they may replicate in isolated compartments to be hidden from the innate cellular immunity dsRNA sensors. Nidovirales DMV structures are linked by a single network of ER-derived membranes. Tubes are membrane structure derived from the Golgi in which bunyaviridae replication takes place. Tubes are close to the assembly and budding sites, and their function may be to connect viral replication and morphogenesis inside viral factories. -Herpes simplex virus forms replication compartments (RCs) in infected cell nuclei as sites of viral DNA replication and late gene transcription. -Baculoviruses reorganize the nuclear architecture by the induction of subnuclear compartments called virogenic stroma (VS) and the peristromal region (PR).